The goal is to provide ” Easy access, easy banking ” with new features to support the needs of 33 million regular visitors. Chase sought to offer consumers easier ways to access their personal details, especially as mobile banking continues its meteoric rise. since many people lack the time or are not interested in visiting a brick-and-mortar branch. Because of this, there is a need and opportunity to adapt in the way to engage with Clients and deliver financial services with the “convenience of Mobile ” and ” the power of Apps “. The new Chase.com, which can be accessed in both Spanish and English, offers a streamlined, consistent experience across mobile, tablet and desktop devices. Users will be able to see customized messages about their upcoming payments and accounts in one location. They may also view a snapshot of their accounts on one page directly after signing in, a tool likely to resonate well with consumers wanting to monitor several accounts. Customers can move different tiles on the new homepage to adjust their details. The side menu will also be visible as consumers explore the site, while the new search feature will enable users to ask questions on whichever page they are. Additionally, Chase made sure to incorporate simplified bill-paying tools. Customers can pay their own bills, send funds to another person and transfer money, all from a singular location. “It’s very important to constantly update the mobile app with the latest technologies – our customers expect it and we want to give them the best experience possible,” Mr. Michael said. 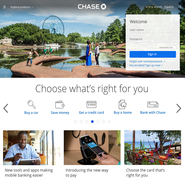 “Last year, we added a variety of enhancements to the Chase mobile app, including Touch ID authentication for iPhones; view checks, statements and deposits; mobile enrollment; paperless settings and more.” Extending on this, Chase is making ongoing efforts to be a leader in the banking sector with plans to install new card-free ATM machines that enable Customers to withdraw funds and complete other financial transactions using their smartphones (see story). Because delivering new Mobile Services is so important, all financial services organizations are expanding their digital offerings to be better positioned to increase relevance and revenue in this strategically important market. For example, Visa is rolling out a new service that enables cardholders to set spending controls, temporarily suspend accounts and receive transaction alerts on mobile in a bid to prevent fraudulent transactions – to reduce business risk and be competitive with other card issuers (see story). 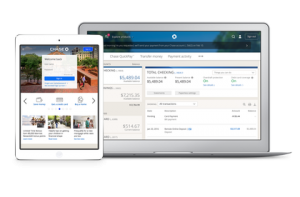 With the new capabilities and consistency across devices in utilizing Chase information services, consumers can choose between downloading its mobile app, using the mobile site or both – since they offer nearly all of the same functionality. 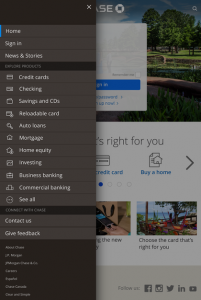 To summarize – “ The new Chase.com has simpler navigation and a modern, clean design that brings the same look and feel our customers love on the mobile app to the online experience,” Mr. Michael said.